More than 600 D.C. students stomped, squeezed and popped their way to a world record Friday afternoon. Students at Lafayette Elementary School broke the Guinness World Record for most people popping bubble wrap at the same time. "It'll be cool to open up the Guinness book and see our school name," said 5th-grader Doug Cohen. Doug ran -- successfully -- for school president on a platform of making bubble-wrap history. After buying the next year's issue of the book, Doug said, he plans to frame the page with their record. 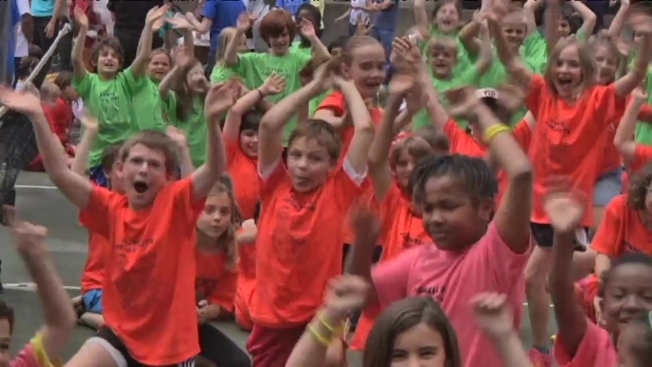 The popping party was part of Lafayette's annual field day. Students from kindergarten to the fifth grade gathered on the tennis courts to participate in the record-breaking attempt. To officially break the record students had to simultaneously pop bubble wrap for two minutes. The record formerly was claimed by a group of 580 students at a school in England. As sheets of bubble wrap were handed out, students had to resist the urge to start popping before the timer started. They paced themselves to make the bubble-wrap last the entire time. D.C. Council member Muriel Bowser joined the students as one of two independent witnesses to the record attempt, as required by Guinness World Record guidelines. Several parents and teachers acted as "stewards" of the event to ensure all the students followed the rules. As students jumped and cheered to celebrate the record, Cohen was happy with one of his last acts as school president. "It's great for the whole school to come together and show off school spirit."